A park bench provides the means to sit and enjoy the views and ambience of the organic vineyards of the Summerhill Pyramid Winery in Kelowna, Okanagan, BC, Canada. Located in the Okanagan Valley near Kelowna, Summerhill Pyramid Winery is intent on producing 100 per cent organic wine, about 80 per cent of the grapes have been certified as being organic and the rest the natural elements. Park bench at the Summerhill Pyramid Winery, a certified organic vineyard, Kelowna, Okanagan, British Columbia, Canada. 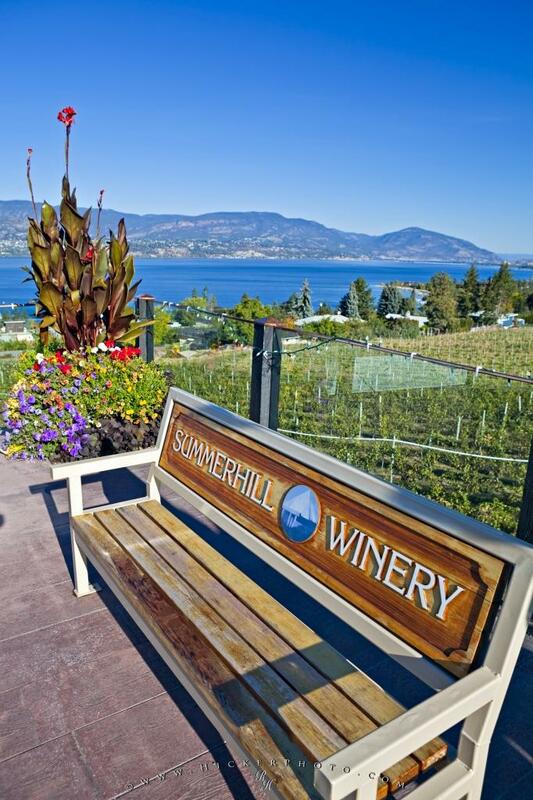 Photo of a seat at the organic Summerhill Pyramid Winery in Kelowna, British Columbia, Canada. Pictures from photo gallery "Winery Pictures"
This picture is part of the photo album "Winery Pictures" - there are more beautiful images waiting for you.